THEY say that in politics, there are no permanent friends or foes between rival factions. This adage proved to be also true in the local telecommunication scene when news broke that Telekom Malaysia (TM) had agreed to buy a 57% stake in Packet One Networks Sdn Bhd (P1) for RM350 million (US$106 million), putting an end to rumours of the much-awaited deal. That this deal is finally done isn’t the big news, frankly speaking. After all, P1’s flirtation with potential investors – including DiGi Telecommunications and YTL Power International – in a bid to either buy them out lock, stock and barrel or at least a stake in the troubled wireless network operator is probably one of the industry’s worst kept secret in recent times. But beyond the obvious synergies outlined by the two parties during the press conference recently, two things beyond the headlines, struck me about the deal. The first is that the need for survival trumps all previous rivalries. After all, the two companies had in the past mounted various acrimonious advertisements in a bid to outdo each other’s subscriber registration campaigns. For context, P1 first launched its wireless service, dubbed P1 4G in 2008, based on the WiMax standard in a bid to challenge other more established wireless players like Maxis, Celcom and DiGi Telecommunications, as well as the incumbent player TM. P1 did so by mounting a popular but controversial multimillion-ringgit marketing and advertising campaign themed 'Cut to WiMax' (pic right, click to enlarge) with the tagline Sudah Potong? (Have You Cut It?). 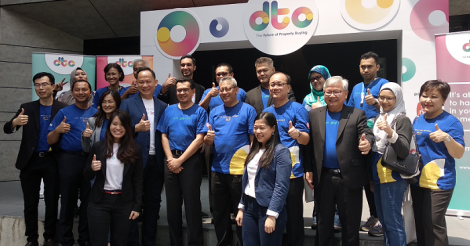 In essence, the campaign was aimed squarely at TM, which was launching wired fibre-based high-speed broadband (HSBB) service, UniFi. It sought to depict fibre as a cumbersome way for subscribers to connect to the Net, as it would require subscribers to drill holes and physically install lines within a premise in order to do so. In a bid to defend its turf, TM returned the salvo by ramping up its own assault on P1, even to the extent of hiring a model that looked a lot like P1’s then chief executive officer (CEO), Michael Lai (pic below, click to enlarge). The ad portrayed the model looking dismayed while leaning out a window with a look-alike P1 modem in search of an optimal WiMax signal. It was intended to debunk the myth that P1’s wireless service is better than TM’s UniFi because of the former’s inconsistent wireless connection – one that cannot be fully trusted as a stable way of connecting to the Internet. Industry watchers in the know noted that the acrimonious way in which P1 went after TM in is Cut to WiMax campaign did cause unhappiness and backlash within the latter camp but looks like the two have buried the hatchet. With this deal done, TM has ostensibly put aside all differences with P1 and is now aligned with a previous rival for the sake of growing its business. In truth though, the deal to me is more than putting aside some old offended feelings. This leads me to my second observation: That TM is finally realising its dream to make a comeback into the very lucrative Malaysian wireless landscape, something that’s in the offing for at least three years now. But why would an incumbent, successful high profile government-linked telco want to get into the highly competitive wireless landscape, and do so this late in the game? Put simply, TM has for many years harboured the hope of re-entering the wireless landscape after the original plan called for it to split its fixed-line and wireless assets. TM’s wireless group later became known as Axiata Group Bhd. Although the original plan called for the split, industry observers have noted that TM has not been fully satisfied with just becoming a pure a fixed-line player with a long-held desire to run its own wireless infrastructure. Its goal? To become what the industry knows as a ‘converged telco’ – a player that is able to offer broadband Internet access, video and fixed and wireless voice. Due to its near monopoly in the fixed line business, TM is no doubt the unbeatable fixed-line broadband player. But as so many subscribers’ lives are going mobile, not having a wireless network would mean that it’s missing out on a huge pie for growth, a trend that might even affect its survival, especially in the coming years. Unbeknownst to many, TM still has a chunk of wireless spectrum in its possession via a 2 x 5MHz block of 850MHz spectrum band – categorised for usage under CDMA (Code Division Multiple Access) technology – it currently owns via its ownership of the now defunct cellular player Mobikom. In addition, there is another 2 x 5MHz block of spectrum which is not owned by any operator but sources close the dealings said that TM is eying this second block in its bid to offer LTE to rural areas due to the better propagation characteristic of the 850MHz frequency. To do this, TM has to apply to the Malaysian Communications and Multimedia Commission (MCMC), the industry regulator, for permission to re-farm the first block of 850Mhz spectrum it owns for Long Term Evolution (LTE) usage, something that it has not undertaken yet, according to people in the know. At the same time, it would need to successfully acquire the second block of unused 2 x 5MHz for LTE use. Sources say that while MCMC seems reluctant to authorise this second block of spectrum, the GLC-backed TM could muscle its way into obtaining this valuable low frequency spectrum under the guise of bridging the digital divide and providing wireless service to rural areas, ostensibly due to its government-backed connections. As it stands today, TM has successfully trialled a 10-site 850MHz LTE system in the northern state of Kedah in June last year, according to business paper The Edge Daily. Another source close to this matter also revealed that following the Kedah trial, up to 26 850Mhz LTE base station sites have been planned for deployment in Pulau Langkawi this year, as a proof of concept to the government that TM is able to pull such a project off. Together with the recently acquired 30Mhz of 2,300MHz WiMax spectrum and 20MHz of 2,600MHz TD-LTE (Time division Long Term Evolution) spectrum, courtesy of the TM-P1 deal, the incumbent player is primed to become a ‘new’ powerhouse in the wireless arena. When asked what TM’s end game is, research firm Analysys Mason believes that that while the long-term strategic outcome of the TM-P1 deal is unclear, there are a number of possibilities for TM. “TM could focus on TD-LTE, wholesaling its 850MHz spectrum to the mobile operators for FD-LTE (Frequency division Long Term Evolution) for enhanced coverage, says Tom Mowat (pic), the research firm’s principal analyst. “Or it may go all out, deploying a nationwide TD-LTE, on both 2,300MHz and 2,600MHz, network of its own and launching wireless broadband services to complement its fixed broadband. “Or still, TM may attempt to become the dominant carrier of mobile traffic, launching a nationwide dual-mode TD- and FD-LTE network,” he says, adding that this would be quite a significant challenge. For a detailed explaination of the differences between FD- and TD-LTE, go here. This recent development understandably has unsettled the rest of the mobile operators as they believe that if TM comes in as a wireless operator, “it would put the rest of us on unequal footing, especially now that it also has the upper LTE frequency bands too, and this is unfair,” says one senior industry executive at an operator. Whatever the scenario, Mowat believes that in terms of LTE spectrum ownership, the TM-P1 deal puts TM in a very competitive position against Maxis, Celcom and DiGi, and the rest of the operators. As for me, I still believe that there are far too many wireless players for Malaysia's market size, more so now with the entrance of the 800-pound gorilla TM in the game. In my view, the entrance of TM does not necessarily signal better times in terms of pricing and quality of service and it remains to been seen how all this would play out in the rest of the year. Because if history has taught us anything, more does not necessarily mean good or better, especially in the in the Malaysian wireless landscape. Goh Thean Eu contributed to this aricle. YTL Comms to be profitable soon?